As you’ve probably noticed from my posts this week, I’ve got shorts on the brain. That’s mainly because Hugo and Elliot wear nothing but shorts all the time now that it feels like the tropics here. I’ve also had at least three people ask me in the past week if you could turn Luna Pants into shorts (the answer: YES!) so I’ve also been thinking about how best to share a quick how-to on that too. This little pair of shorts has really held up remarkably well for being a) white and b) double gauze. They’re size 3 Parsley Pants that I shortened (<- tutorial there) and we’re on our second summer of them fitting Hugo. Also on my list of future things to post about: double gauze. The name is so intimidating but it’s such a comfy fabric to wear and really not that hard to sew!! The Charlie tunic (which I modified slightly with a curved hem) is now too small, but these two really made a cute combo while they both still fit. Most of Hugo’s clothing this summer is handmade hand-me-downs from when Elliot and Clementine were four and I made a ridiculous amount of their clothing (esp. for Celebrate the BOY, summer edition, which probably no one even remembers anymore, but also these helicopter pajamas, and these red pants of Clem’s got shortened into shorts too). It’s been a real joy to pull those out and reminisce about little four-year-old Elliot or Clementine wearing them. WAAAH they grow up so FAST! Interestingly, I do find the handmade stuff is standing up better than the store bought stuff, not only because I think I make it last better, but also because the handmade stuff seems more timeless. The (small amount of) store-bought stuff we bought for Elliot when he was this age already looks somewhat dated. Are you sewing shorts this summer? For you or for kiddos? I have always felt that the two most essential garments in a child’s wardrobe are a basic pair of pants and a tee shirt. It was on this premise that I designed my two children’s patterns, the Flashback Tee for knits and the Parsley Pants for woven fabrics, and it’s also the reason that my Sewing for Little Ones series on Creativebug begins with how to make basic pants and ends with how to make a Trace-and-Make tee. 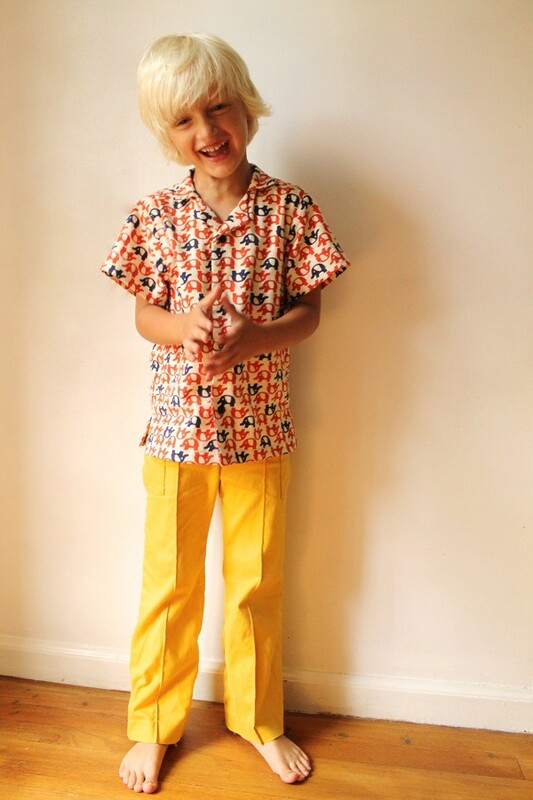 I love being able to whip up a tee and pants for my own kiddos; it’s such a fun and gratifying thing to sew an easy outfit in an afternoon (also: Elliot, at 9, still prefers my “soft pants” to store-bought). I made this little outfit for Hugo when I was writing my outlines for the Creativebug classes, and as you can see, the result is completely wearable and cute. I used the dog print from my Small World corduroy fabric line for the pants, and that soft yellow knit (I swear this is the PERFECT shade of yellow) is from Cloud9’s knit solids collection. Cloud9 provided ALL of the fabrics I used to teach the classes, by the way; I’m partial to their fabrics, as you probably already know. Begin your foray into sewing for little ones with Rae’s Parsley Pants pattern. Rae shows you how to work with multi-sized patterns and covers tricky techniques like sewing curves and adding an elastic waistband. This pattern is practical and simple, and you will get the satisfaction of seeing an entire garment come together in just a couple of hours. Start building your basic garment construction skills with this class. I have even more to say about the second class (“Sew a Beginner Dress”) yet, but I’ll save that for a later post. I couldn’t be more thrilled with how these classes turned out and I really hope that you will subscribe and watch them if you haven’t already. I’ve known for a long time that I wanted to offer video somehow, to make an extra instructional resource available for people who wanted to try my sewing patterns but maybe needed a little more support (and I’ve done a handful of campy how-to videos for a few of my sewing patterns), but but holy sh*t is it ever hard to film, edit, and publish video on your own. I’m still a little gobsmacked at how adeptly the editors whittled down an entire week’s worth of shooting into these three thorough yet concise classes that can each be watched from start to finish in one sitting (and, Bonus Miracle: manage not to make me look like a total idiot!). I can’t say this without sounding like a total fan-girl, but it was such an honor to have had the opportunity to partner with Creativebug on this thing and I’m proud to be able to put my name on such a high-quality project. Note: all Creativebug links in this post are affiliate links, which means I earn a small amount if you subscribe via one of my links. Now that it’s fall and I’m working on sewing my own pants, I thought it would be fun to take a look at what people have been making with my kids’ pants patterns! The Parsley Pants pattern is so simple and infinitely adaptable. Once you get the basic steps down, you can customize the style (by adding pockets! a flat front waistband! tuxedo stripes!) and combine fabrics to make Parsleys into PJs, dress pants, costumes, you name it. The Moon Pants are newer to my pattern collection, and they’re wonderfully comfy and whimsical, in keeping with the current supercomfy-yet-kindadressy trend that seems to have taken hold. 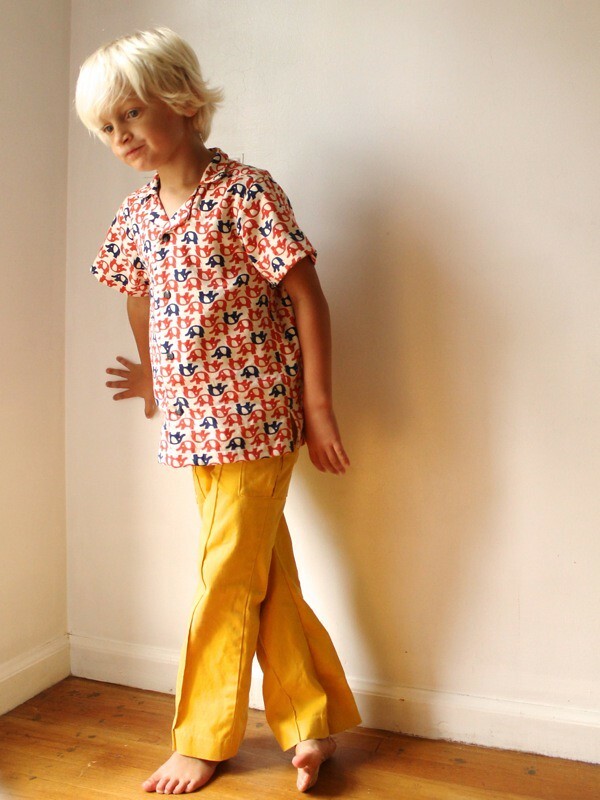 While this pattern does lend itself to girls’ pants, I made it into a pair of sweatpants that look great on Elliot, and I can see it in a linen blend as warm-weather pants for boys. He’s my little Ninja. Er…I guess not so little anymore? Medium-sized Ninja? The kid is always throwing punches and kicks and generally bouncing off the wall. I’m not sure where all the energy comes from but it seems to be infinite. So a NINJA Flashback Tee (with short sleeves and a shoulder mod) seemed perfect. Paired here with some blue twill Parsley Pants that were oh-so-simple to sew: just the basic pants with an elastic waistband and a “tuxedo” stripe with a scrap of fabric my friend Chris gave me at the Weekend Sewing Retreat last fall stitched down the side. There’s also a quick tuxedo stripe tutorial at this post, but it’s also one of the many options included in the Parsley Pants Pattern. After talking about how awesome Lillestof knits are in my favorite knits post, I figured I should put my money where my mouth was and actually sew with them to see what all the fuss was about. Um, yeah. They’re awesome. Lovely amount of stretch, very soft, wash well, don’t fade. LOVE. Definitely worth the extra dollars in my opinion, and trust me, I’m a sucker for cheap knits too so I think I know what I’m talking about. I got this ninja print at Simplifi but you can find more sources for Lillestof in that favorite knits post. Maybe I’m feeling nostalgic today, but it gets me a little choked up when I think about how many of you “know” this kid. Like, you’ve read for years and watched him grow up, and make his silly faces and poses and be a goofball (you need to go look at at that Hansel post if you haven’t seen it yet, it’s kinda my Opus) in more than one post, and even though it’s through the screen, you feel like you have a sense of his personality, you know? I suppose some people could get creeped out by that but the glass-is-half-full me thinks it’s pretty fun that so many of you can enjoy his great personality. On the other hand, I am acutely conscious of the fact that he’s never had a say about (or even really comprehend the concept of) having his face be so familiar to literally millions of people. I’ve started talking to him about that, because I think he’s old enough to start understanding what that means. 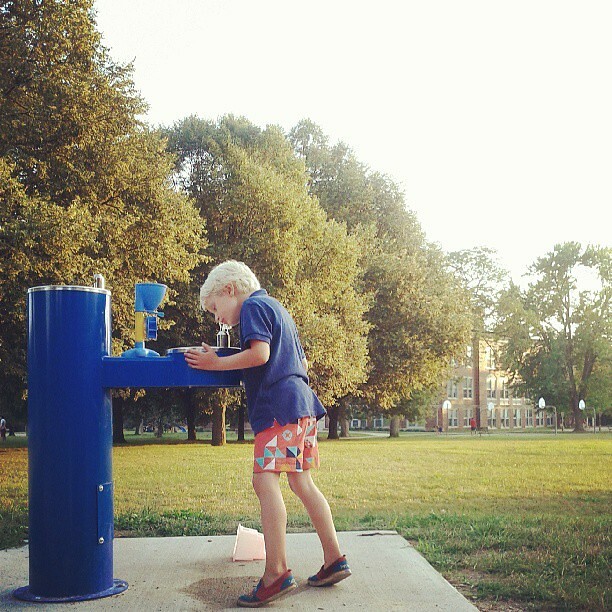 Someday he may ask me not to put his pictures on my blog and I will say OK, but at least for now he’s having fun. Please don’t pin or repost pictures of Elliot. Thanks! One of the reasons I designed the Parsley Pants the way I did (as a 2-pc pant) was so that I could whip out pairs for my kids in no time flat. Seems the other patterns I had for pants often involved zip flies, recessed pockets, multi-pieced waistbands, or some sort of extra finishing at the cuffs or hems, and while I love those pant patterns too, they just aren’t FAST. You know? I wanted something like the Flashback Tee (another new striped Flashback for Clementine is shown below) something that could come together in an hour without too much hassle. And thus the Parsley Pant pattern was born. But…there’s something that makes them even faster: upcycling old adult pants for the fabric. Because then…NO HEMMING!!! So last week I cut apart two pairs of JCrew chinos in pastel colors that I used to wear back in the 00’s and turned them into pants for Clementine. The addition of the pouch pockets was the only thing that kept these from being a half hour project, seriously. And they are not only adorable, but she wears them. DOUBLE YAY! use old pants that aren’t too worn out; the fabric needs to be in good shape. You can cut around (or cover up) stains, but make sure the fabric isn’t threadbare at the knees or anything. 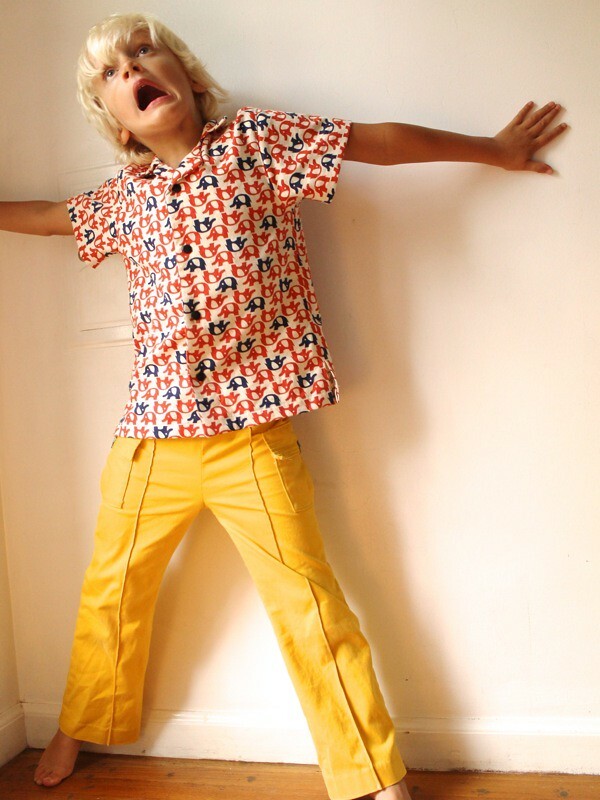 You want these pants to stand up in their second life as kid’s pants! I usually only use old pants that still have their cuffs or hems in good shape, so that the old hems can become new hems. To harvest the old pant fabric, cut up the inner leg seams (inseams) with a scissors, then up the crotch seams in front and back, then across the sides of the pants below the waistband as shown in the diagram below. Usually there’s not much salvageable fabric in the waistband, zipper area and pockets, so I just cut those away. DO NOT CUT THE SIDE SEAMS OPEN! LEAVE THE HEMS INTACT! Then lay your pant fabric flat (as flat as you can; some women’s pants have shaping at the hip on the side seam) and place your Parsley pattern over top of the fabric with the original pant hems even with the line on the pattern that says “finished hem line,” and the side seam of the original pant as close to the “tuxedo stripe line” as possible (see diagram below; the lower layer in the diagram is the old pant leg opened up and laid flat). Cut out two mirror image pant pieces, then assemble them according to the instructions. You can still add pockets, tuxedo stripes, pintucks, a flat front, or any of the other “extras” that come with the pattern. The main difference here is that you don’t have to hem them, because your hems are already finished! Additionally, the old side seam makes it look like you’ve put in extra work when you haven’t. NICE. The big win here for me was the addition of two new quick and cheap pairs of pants to Clementine’s wardrobe (and the tee was quick too!). Love it! I couldn’t resist showing you the outfit he picked here, partly because his hair is SO GLORIOUS but also because the outfit actually coordinates. He wears clothing I’ve made him pretty much every day, but usually picks odd combinations of stripes and prints (actually, now that I think about it, it would be great to blog some of the more hilarious combinations as well). This is the shirt that he wore for the first day of school this year (also made by me with one of my own patterns). I love the Kokka fabric on the shirt not only because of the cute elephant print but because it’s really soft. Somehow I ended up making all of my kids’ shorts this summer (too lazy to buy them…haha), and it seems like we are always running out of pairs to wear because they’re in the laundry. Kids get dirty, especially in the summer. Go figure. So I finished up another pair for Elliot earlier this week with a bit of fabric I had left over from the Washi Dress I made with the same print. I know I’ve mentioned this before, but this print is probably my favorite from the Tsuru line. Quilting cotton is perfect for summer shorts, and it means I can make much more colorful and interesting items, especially for Elliot, who is now entering the size category of boys’ clothing that is entirely boring. I mean, total snoozefest. What is UP with that?! I trimmed off the Parsley Pants pattern as shown in my “Make Shorts from Pants” tutorial to make them into shorts (I believe I measured 6 or 7″ down the inseam) and used the most basic waistband option, which is just elastic all the way around. I also double-stitched the hems; this is something I learned from Dana, and I love how it makes them look a bit more “BOY” and profesh. Speaking of Dana and shorts, if having a ready-to-go shorts pattern in your arsenal is more your speed than cutting off pants (I hear that! 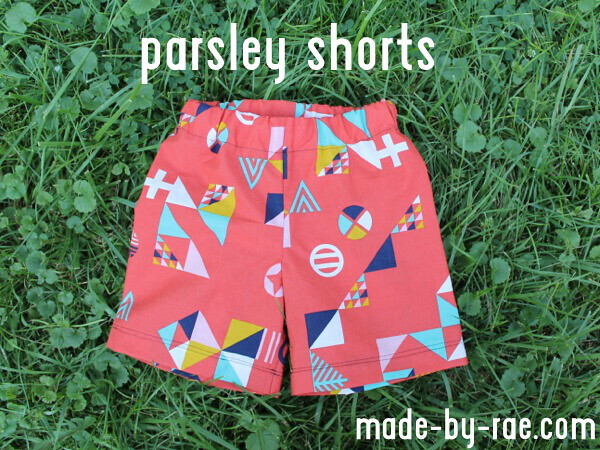 ), you should definitely check out her recently released KID Shorts pattern, which is really great! It’s formatted a bit differently from the typical eBook instructions; I love that she’s doing a series of blog posts to show you how to make all kinds of different shorts with the one pattern (which is totally the way I love to sew)! It was difficult to get a good photo of these shorts ON the child. By the time I got my camera and brought it outside, he had already turned on the hose and sprayed himself with it. I just had to laugh…it’s so ELLIOT. I did manage to snap the shot below with my phone later in the evening when we went to the park. I think it captures something wonderful about summer evenings, when the sun is going down but it’s still warm and light outside. I love summer so much. 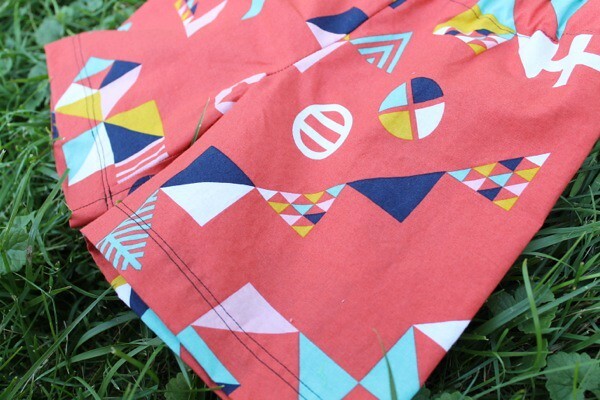 See what everyone is making for summer with the Parsley Pants Sewing Pattern!